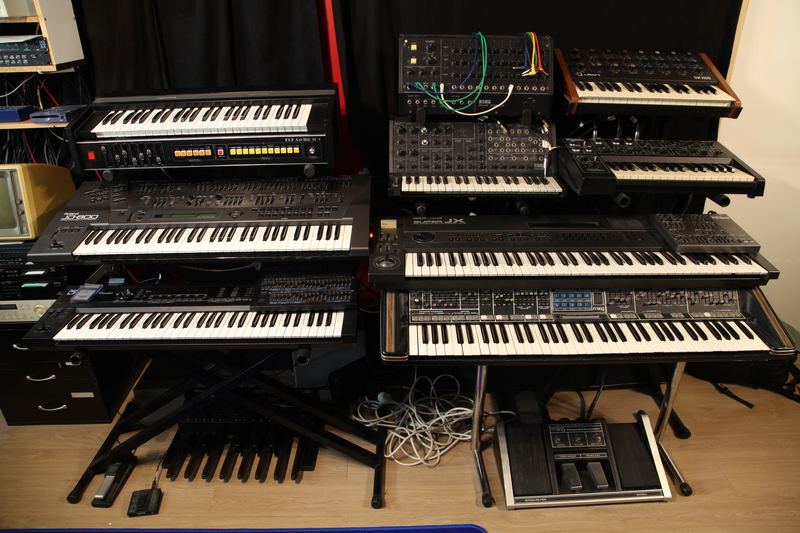 Roland Juno 2 with PG 300, Yamaha DX 7, Korg 01/W fd, Roland HS 60, Roland JX 10 with PG 800, Roland XP 10, Korg DW 8000, Roland D 50 with PG 1000, Roland JD 800, Korg MicroKorg, Clavia Nord Modular, Moog Polymoog, Moog Micromoog, Korg MS 20, Roland SH 101, Yamaha CS 5, Roland SH 1, Jen SX 1000, ARP 2600, Eminent Solina String Ensemble, Formanta Polivoks, Xynthi A, Elka Solist 505, Dubreq Stylophone, Korg Kaossilator, Korg Monotron, Korg Volca FM, Roland D 110, Casio VL 1. Akai S 2000, Roland S 550, Casio SK 1. 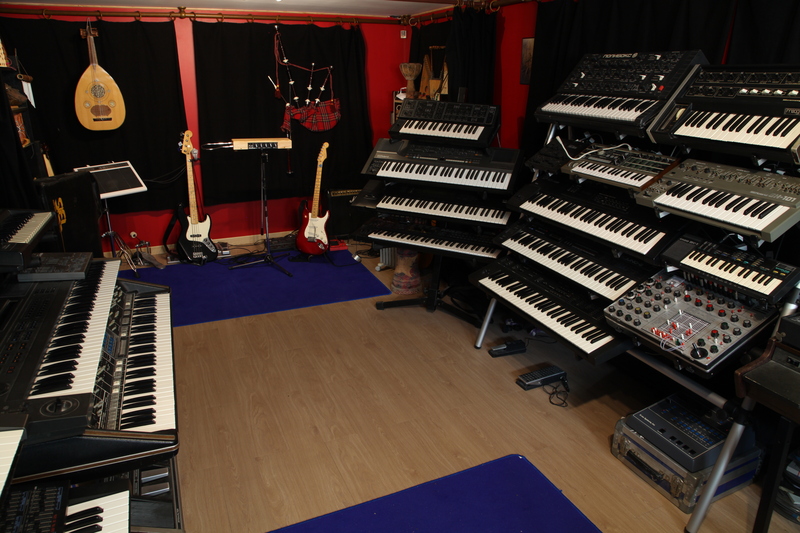 Samplitude Pro X working with PC with sound card Edirol UA 25 EX, MFB Urzwerg Pro, Korg SQ 10, ARP Sequencer. 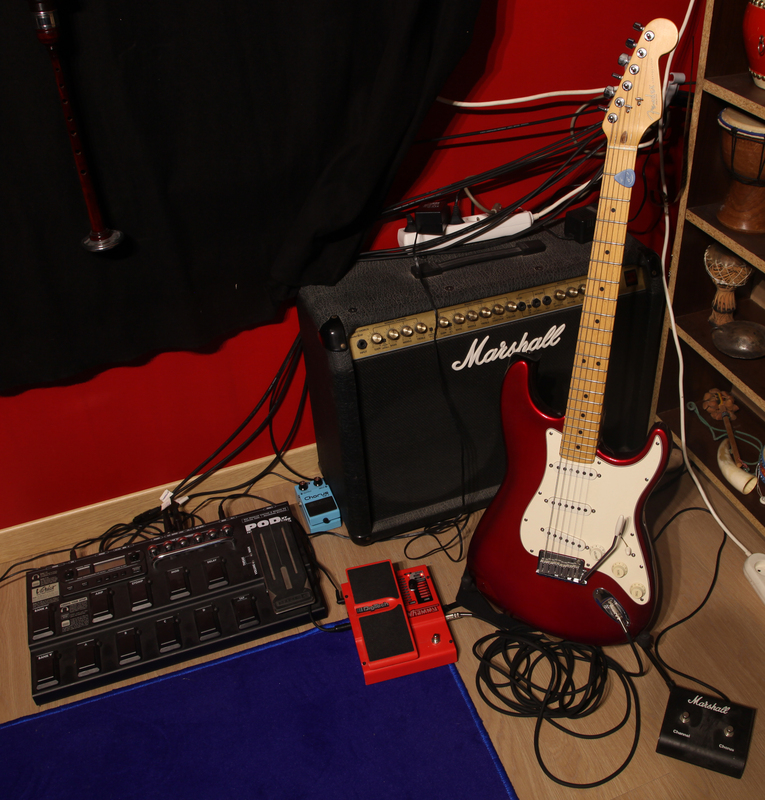 Etherwave Theremin plus, many virtual synths, Electric guitar Fender Stratocaster with Line Pod XT Live, Digitech Whammy and Line 6 DL 4, Bass guitar Fender Jazz Bass with Boss GT 10B, Saxophone alto Yamaha YAS 280, Multi effects MIDIVERB 2, Lexicon PCM 70, Boss PH 2, Boss CE 2, Boss RE 20, Electro Harmonix Small Stone MK 2, Strymon Big Sky, Midi pedal Roland PK 5 A, Patchbay A880, Patchbay MOTU Midi Express XT, Save unit of sysexs Datadisk, Kenton Pro Solo, Mixer Mackie Onyx 32-4-2, Micro Shure SM 58, Recorder Revox B 77, Mixing software Magix Samplitude Pro X with sound card Fireface 400, Monitors Mackie HR 824. It is my first synth. Bought in 1988, I can never part from it! A polyphonic synth easy to program with the PG 300. I use it especially for the precise basses. It also gets good sounds of pads and lead. This synth gets magnificent sounds of choirs, strings, organs. Ideal for pads. The kind of synth that inspires as soon as we put fingers above. It is because of it that everything began. It was at my cousin’s before I started to build my studio (in the 80s). I tried it, it was the first time when I put my hands on a synthesizer, and then… This Juno 106 with loudspeakers is very close to Juno 2 and even more powerful about the filter and certain sounds. Digital synth of the end of the 90s with limited possibilities of programming. It possesses however a good arpegiator and some very good tones. I had bought it to have a master keyboard when my Juno 2 began to work badly … I use it especially for the rather good sounds of percussions. Mythical synth of the 80’s which was the answer to the DX 7 of Yamaha. Powerful and ample tones based on the L.A. synthesis. 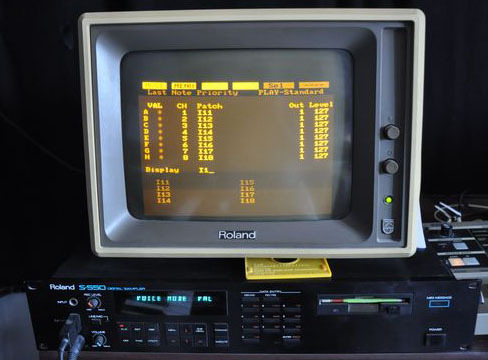 Excel at numerous registers: basses, pads, leads, organs, crystalline sounds and effects … The programming of sounds is facilitated by the programmer PG 1000. 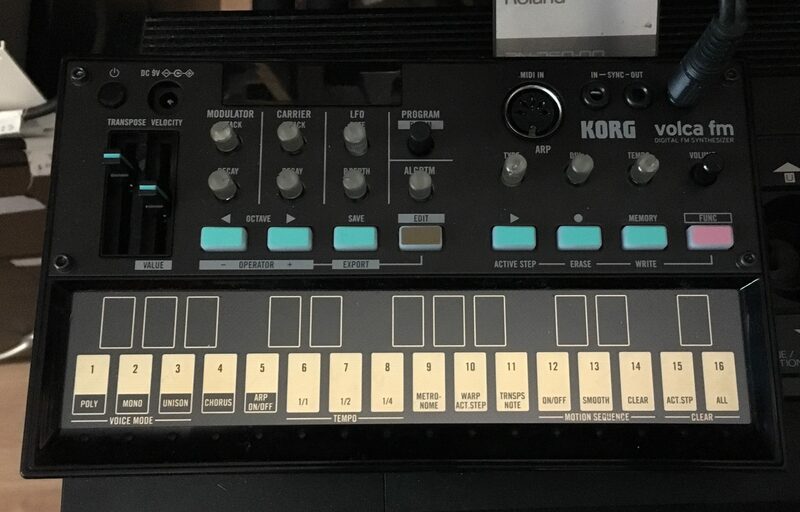 This digital synth of the beginning of the 90’s returned the easy programming of sounds with an interface of analog type (with a lot of sliders, knobs…). Excellent for pads. This synth-vocoder is a small bomb. It sounds extremely powerful. Ideal for the rhythmical electronic music, but not only. The possibilities of sound creations are huge. It also gets a very good arpegiator and a 8 steps sequencer evolved. I could not part from it any more. 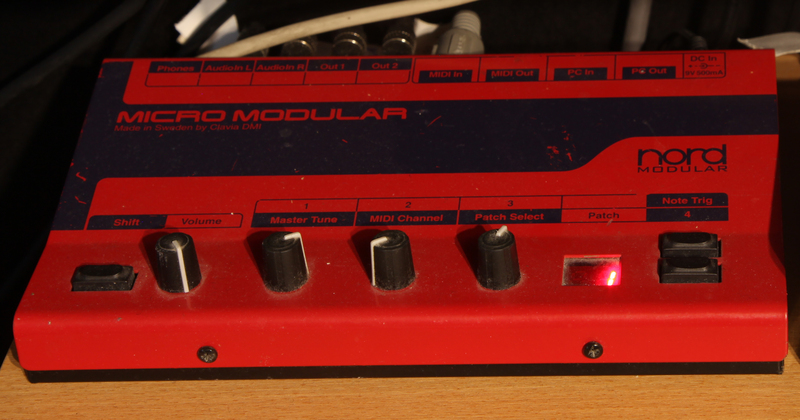 It is a very typical 80’s synth that generates beautiful pads, but not only. For me, its strength is based on its arpegiator, which is really good with the delays the device offers. 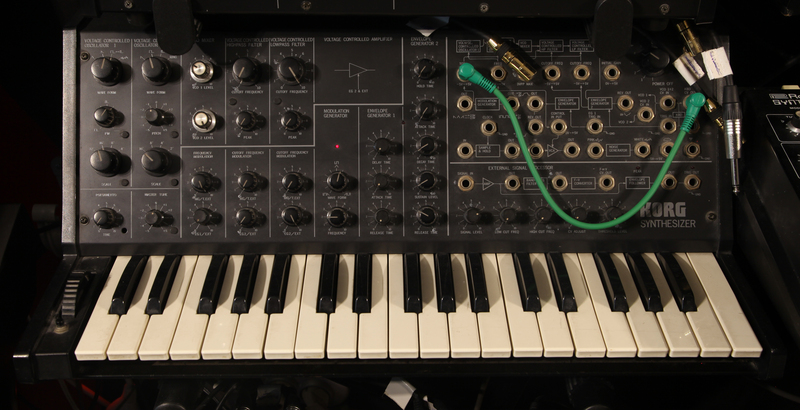 This small expander generates sounds from the analog modeling synthesis of Clavia synths. It is a modular synth with infinite possibilities of editing because it is made in a virtual way via a software of editing. Sounds are very diversified and the sound gets a big personality. Very good for the current electronic sounds. Polyphonic analog synth with presets of around thirty kilos(!). The sound possibilities are limited enough all the same and a little bit laborious programming. The philosophy of programming is very particular… That sounds all the same very analog. Small analog synth with a great filter. The Moog’s sound is really here. 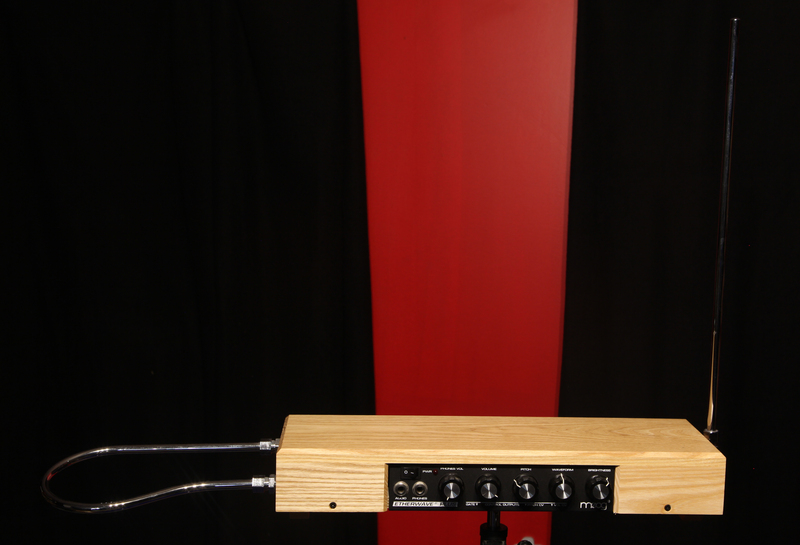 Many interesting possibilities of modulations give to this synth an attractive instrument. A semi-modular analog synth which sounds. With its 2 filters (1 high pass and 1 low pass), it really has a sound identity. The possibilities of sound creations are wide, on the condition of knowing programming modular synths. It looks nice and I use it with pleasure. This analog synth gets a very good filter and a keyboard pleasant to play. In spite of its appearances, it gets big sound possibilities with more an arpegiator and a mini sequencer. Some good basses and leads. Of my analog synths, it is one of my favourites. This Italian analog synth gets a very good keyboard. It makes little thing, but it makes it very well. The analog heat is very there. I like its look. The visual aspect of a synth is important for me. I find this one very beautiful! 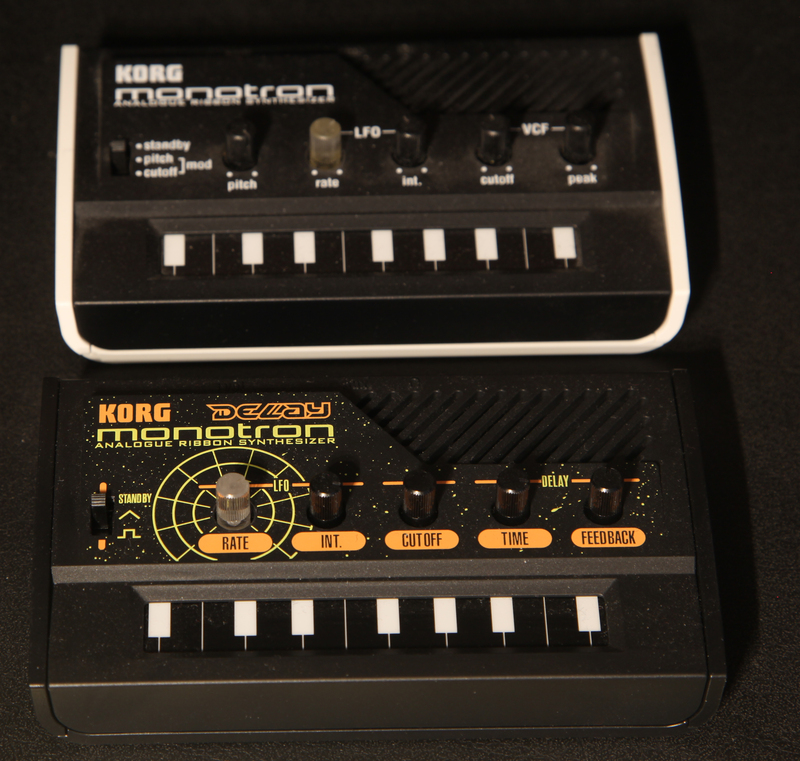 This very easy to use analog synth gets a precise sound. It has not many possibilities of editing but goes to the main part. I like its basses. An analog synth with vast possibilities. A pure analog sound, very warm. Successful in all the registers of the electronic music. 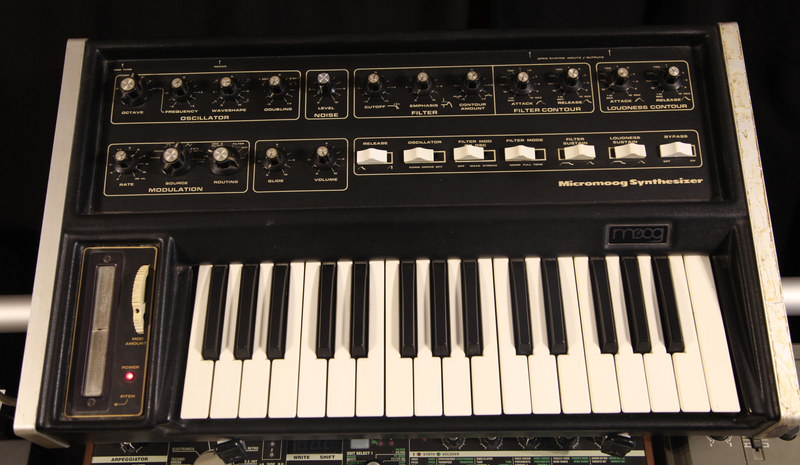 Used by the greatest composers, this mythical synth is 40 years old. An analog masterpiece. Incredible possibilities, high-powered filter make of this semi-modular an unequalled instrument. 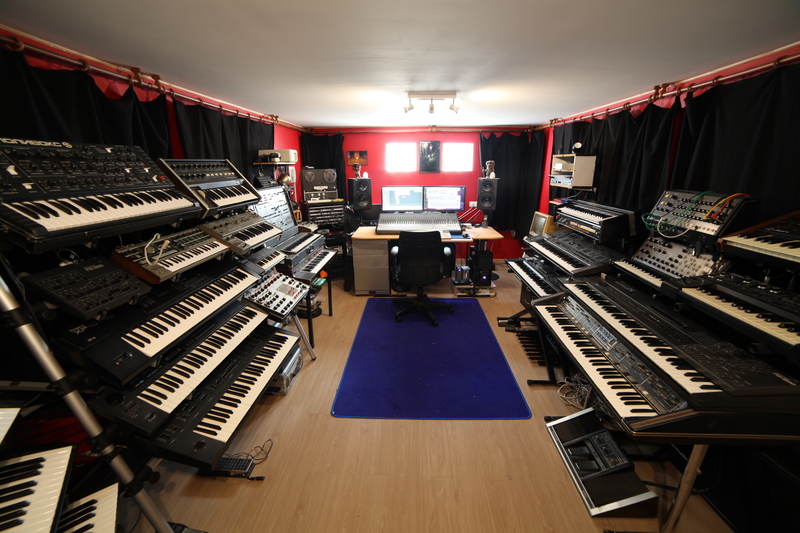 It is THE analog synth which it is necessary to get. I realized a dream by buying it. 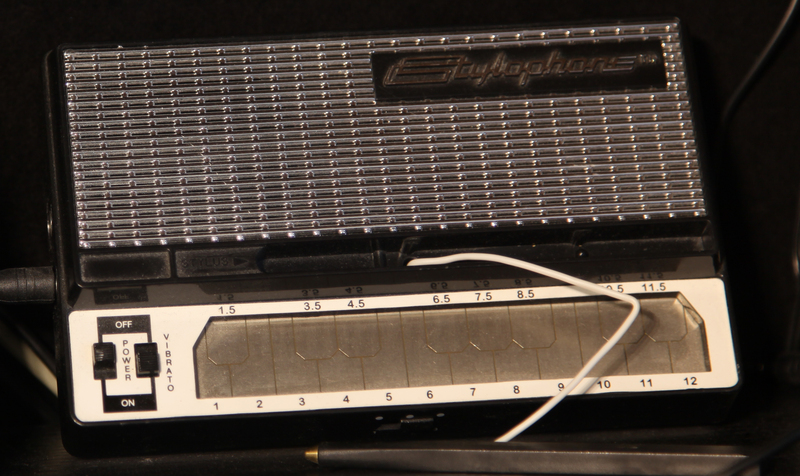 This is an analog « String Machine » often used in the music of the 70’s. 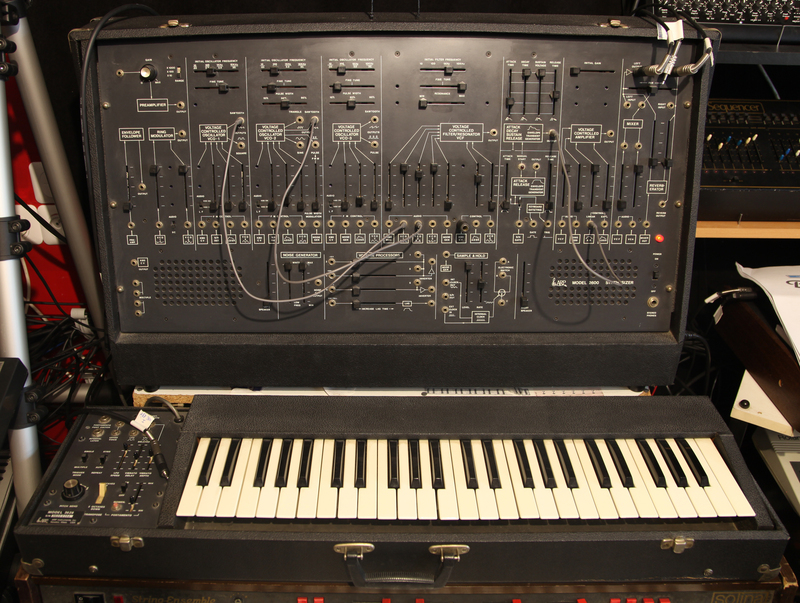 It is the mono version of the Arp Solina. The chorus sound of strings is very typical and gives a nostalgic side to the piece in which it plays. Magnificent! This analog synth is often considered as the russian Minimoog. It gets a powerful and dirty filter once put to the extreme. Sounds are rich and the possibilities of modulations are particularly interesting. A small synth that makes few things but it gets an incredible musicality as of an effect is added. Won at the SynthFest 2016 tombola, this small synth uses, as the DX7, the synthesis FM. Its programming is easy with the knobs. There are some other interesting functions (arpegiateur etc. …). Sounds are good quality and it sounds very FM synthesis actually. 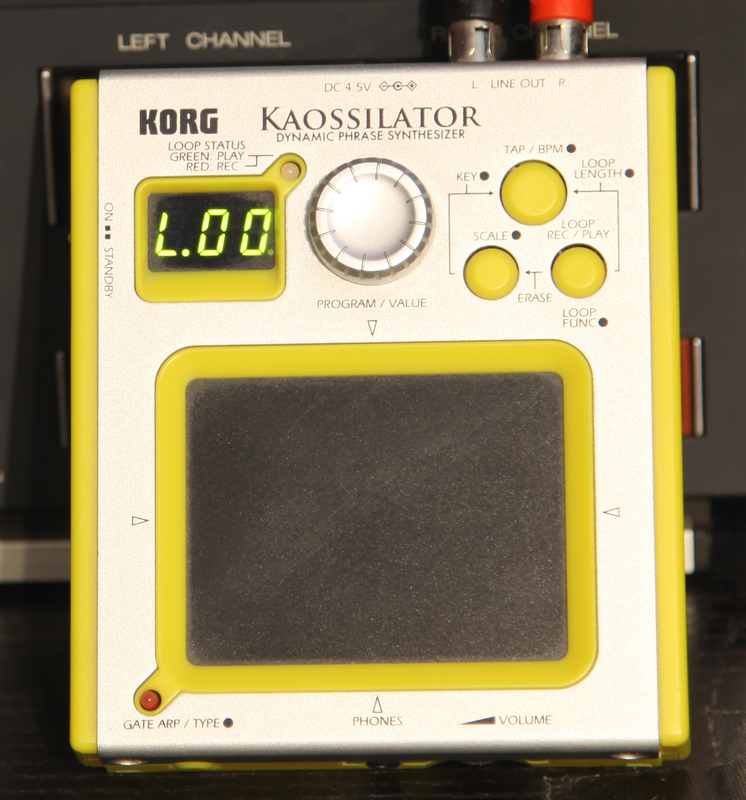 This small synth looks like a toy but it gets some interesting tones once played with effects. It also gets rythmic patterns. The famous piece Da! Da! Da! of Tryo was elaborated with this instrument. This is the expander version of the D 20, digital multitimbral synth. Its sounds are based on the L.A. synthesis. Less powerful than D 50, it is all the same capable of good surprises. It is with it, coupled with a sequencer Alesis MMT 8, that I made all my first compositions (until the arrival of the S 550…). This sampler 12 bits gets a monitor and a mouse to edit sounds. Tones are rather warm for the digital technology. The arrival of this machine in my studio was a real revolution. With the S 550, I was able to begin to compose with \ »acoustic\ » sounds: beautiful choirs, beautiful strings, beautiful percussions, … It is by far the instrument which I most used in my compositions. Impossible to separate me from it. It is the best of Roland samplers. A more powerful S 550 because it is stereo and samples in 16 bits in 48 kHz. With its 32 Mb memory (much at the moment), it can record more than one minute in stereo. An external CD Rom drive quickly offers a great sound library. It is better quality than S 2000 especially in the basses. Its only default is not to have portamento. As with the S 550, the editing is facilitated by the use of an external monitor and a mouse. This sampler 16 bits is in stereo and gets a CD ROM player. It is complementary of S 550. It gets very nice possibilities of synthesis but regrettably, because of its little visual programming (menus and under menus on a small LCD monitor), I use it only as player of samples. It gave me some big services on certain pieces. It is probably the smallest sampler ever. It can sample some seconds mono and low resolution. The sample can be looped. An envelope, a vibrato and a portamento are the treatments which can modify it. This instrument also gets very basic sounds, rhythms and a mini sequencer. 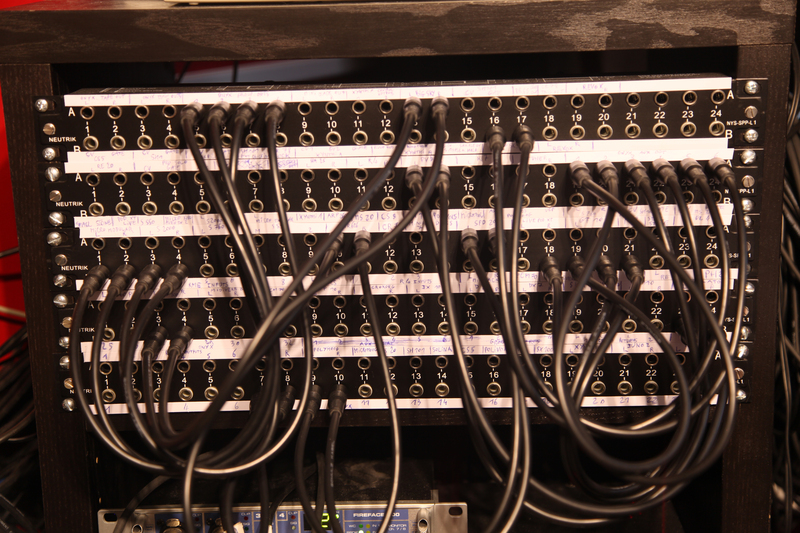 It is an analog sequencer with 4 inputs CV+Gate and a MIDI interface. Many possibilities of editing make this device a very interesting stuff for the creation of ambient electro musics. 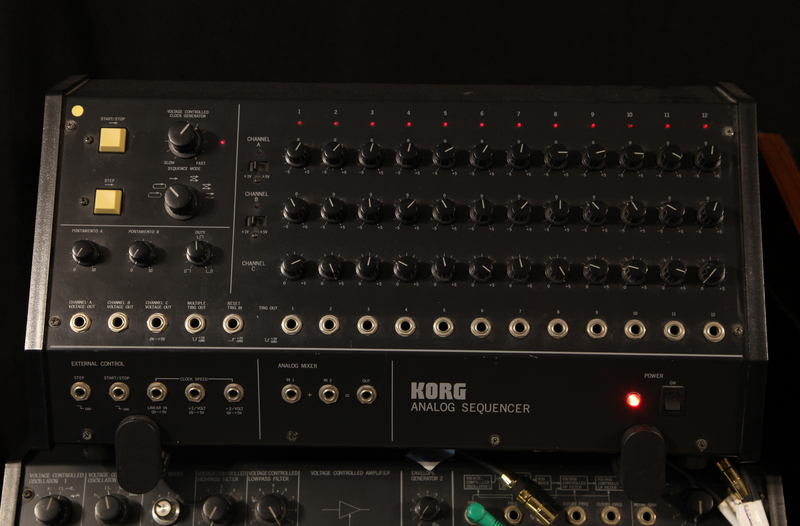 This analog sequencer was built for the MS series of Korg. I use it to create sequences with the MS 20. It gets 3 times 12 steps (up to 24) and offers interesting possibilities still different from the Urzwerg. The MS 20 takes another dimension. This analog sequencer is one of the best. 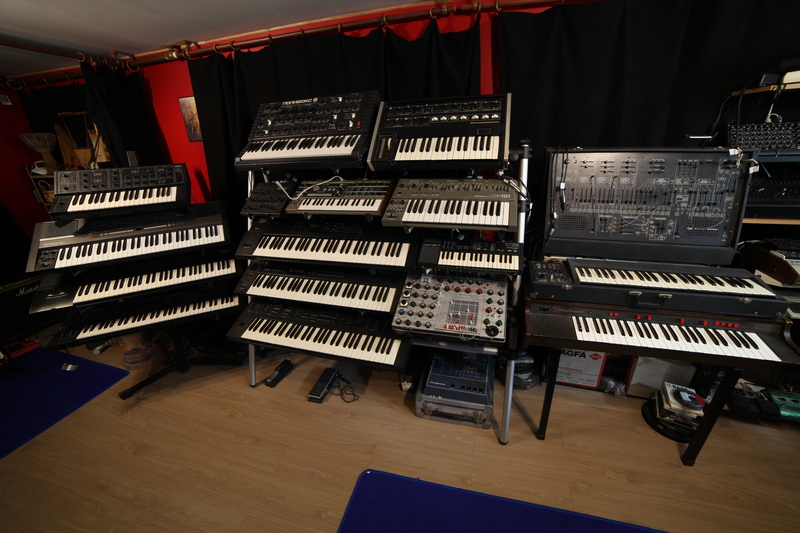 It is the ideal complement to sequence the ARP 2600, but also the others analog synths of my set. It gets 16 steps (or twice 8). It gets a random playing mode (contrary to the SQ 10). Many possibilities. 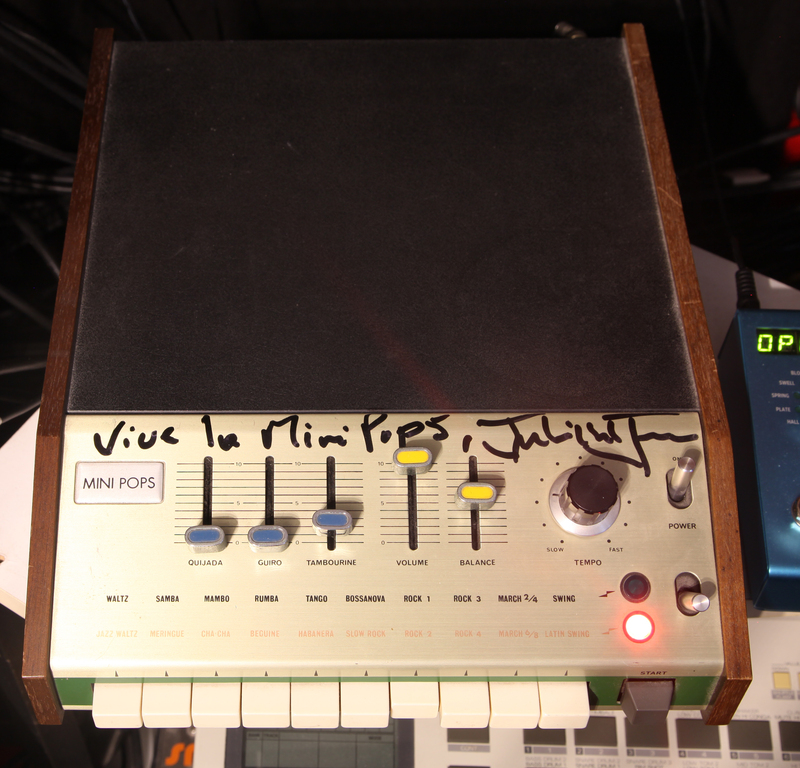 For those who do not know this drum machine of the 70s, it is legendary because it is the rhythmic signature of albums » Oxygene » and « Equinox » composed by Jean-Michel Jarre. The analog sound is very warm, the bass drum generates very good basses … Very easy to use, it gets 20 rhythms (combinable) and is not programmable. As you can see, I made it dedicated by Jean-Michel Jarre. This analog drum machine with a very characteristic sound was very used in particular by Phil Collins (« In the air tonight », albums « Duke », « Abacab », » We can’t dance « ). A mythical instrument. 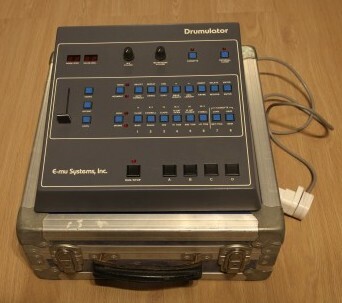 This drum machine has a great historic value for me, because it belonged to Alan Wilder (ex keyboard of Depeche Mode). It appears on the album » Construction time again » (on which appear pieces as « Everything counts « , » Two minute warning « , » Told you so « , » Love in itself « ). The sound of this drum machine sounds very « electric » and dynamic. Not very much used nowadays, it was very fashionable in the 80s. Unfortunately, it doesn’t work anymore. Small drum machine with very basic sounds and with analog tones of the beginning of the 80s. its tones can be heard in particular on the album » Speak and Spell » of Depeche Mode. A Clock out allows to run with an analog sequencer for example. 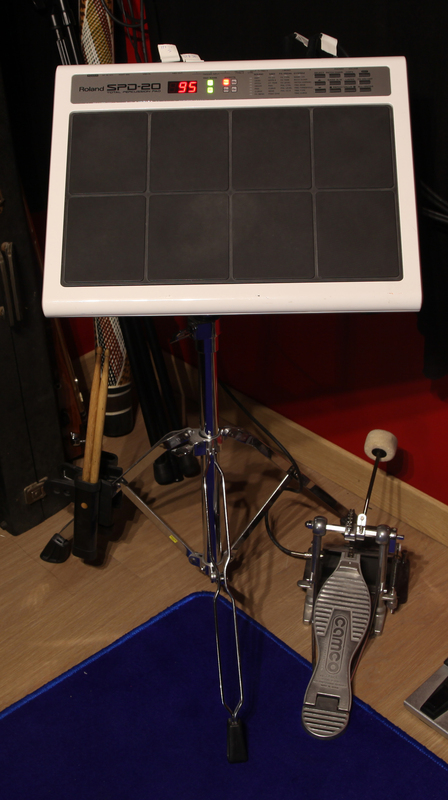 This electronic drum gets good tones and allows me more expressiveness in the elaboration of rhythms. Small electronic instrument with metallic keyboard endowed with a pen to play the notes. It gets three basic tones and a vibrato. Interesting when played with effects. This digital synth without keyboard is used by walking the finger on a touch pad. What allows to develop the sound in the time. Sounds, very electronic for the greater part, are very good quality. The possibilities of looping are interesting. To use especially for effects. Mythical electric guitar. I use it with a Line Pod XT Live which feigns the amplis best. What allows me to obtain tones close to those of David Gilmour ( Pink Floyd) whom I like particularly. I also use Digitech Whammy which allows to increase or to decrease the pitch in a progressive way. Finally Ebow, which serves as sort of bow, allows me to obtain sounds of sustained strings. Famous Fender bass guitar. It is the Mexican standard version. 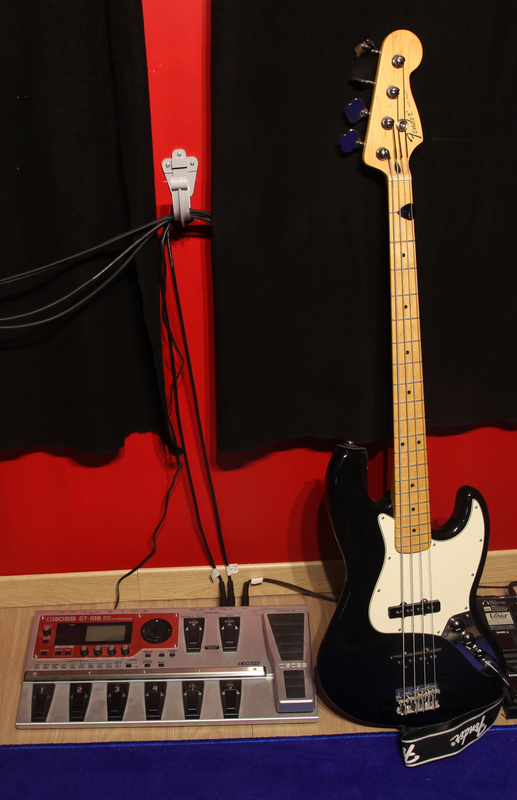 I use it with the very correct Boss GT 10 B, a multi-effect and an amp simulator for bass guitar. 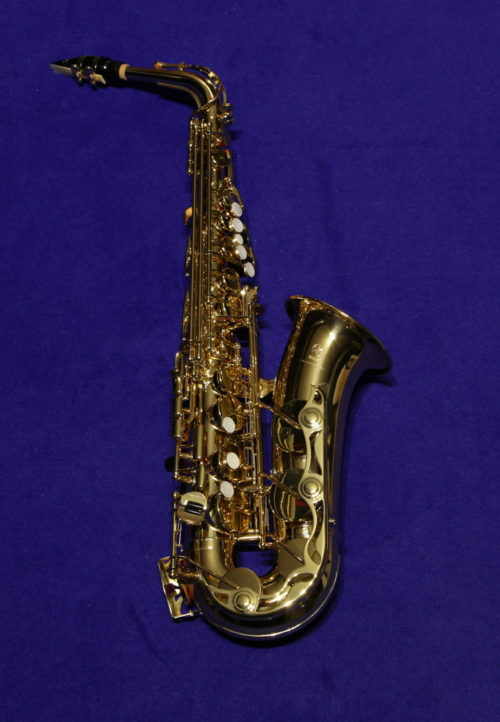 For a long time, I wanted to acquire an alto saxophone. I took my desicion because I needed it on a piece in particular. With this Midi pedal, I can play a bass line with the foot, the chords with the left hand and the lead with the right hand. That allows me to have a more precise idea of the result of a melody in real time. This device is a MIDI dispatch, indispensable for the connection in network of numerous instruments using the MIDI standard. It is another MIDI dispatch that can route whatever inputs to whatever outpouts. The internal routing is visually made with the help of a software. This device is used for storing sysexs (messages of system exclusive). I use it to protect sounds of Juno 2, D110, etc. but also sequences. Analog mixing console of 32 voices with 4 buses. It replaces now my Promix 01. The analog interface is easier than on the digital consoles with menus and submenus etc. Indispensable in a studio, the dispatch is used for connecting devices each other in a simple and fast way. I got five. 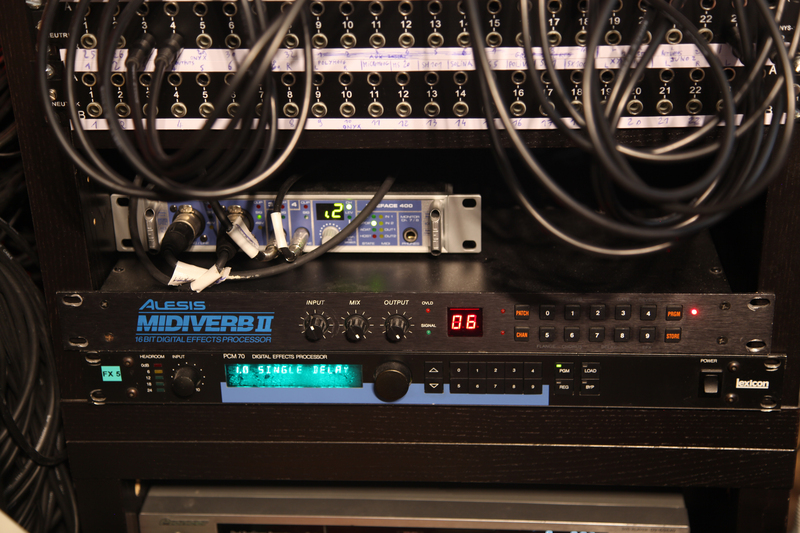 This module of effect Alesis Midiverb 2, in spite of it is not programmable, gets a good sound. 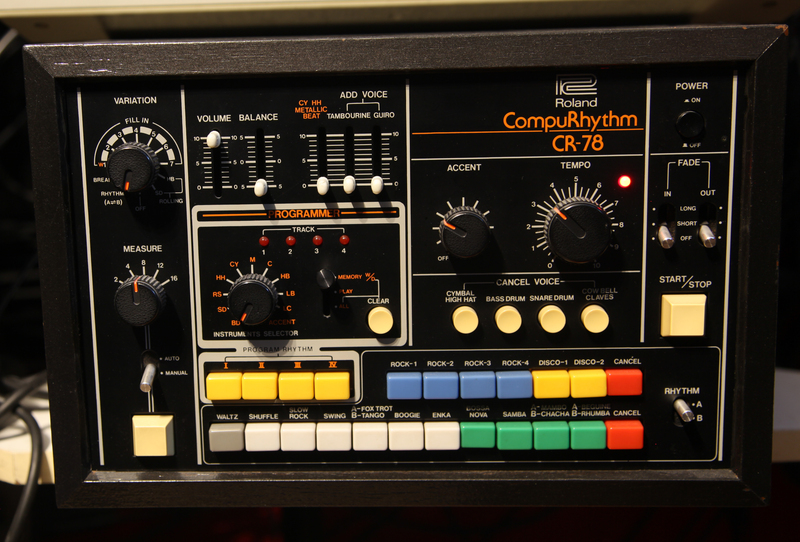 There is also Lexicon PCM 70, great classic of the 80s regarding reverb. This software is used as tape recorder, as editor and as mixer. Very powerful, it surpasses Pro Tools in performances, even if it is less known. I use it since 1995. It works with a PC provided with a sound card RME Fireface 400. 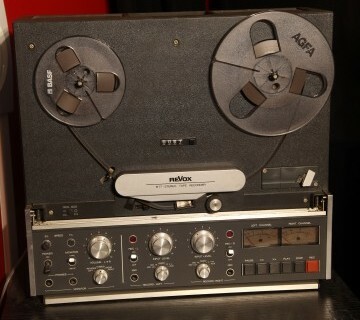 Previously, my demos were recorded on a 4 tracks tape-recorder Fostex X26! I’ve bought this tape recorder in order to get real flanging effects that I couldn’t get with a digital device. 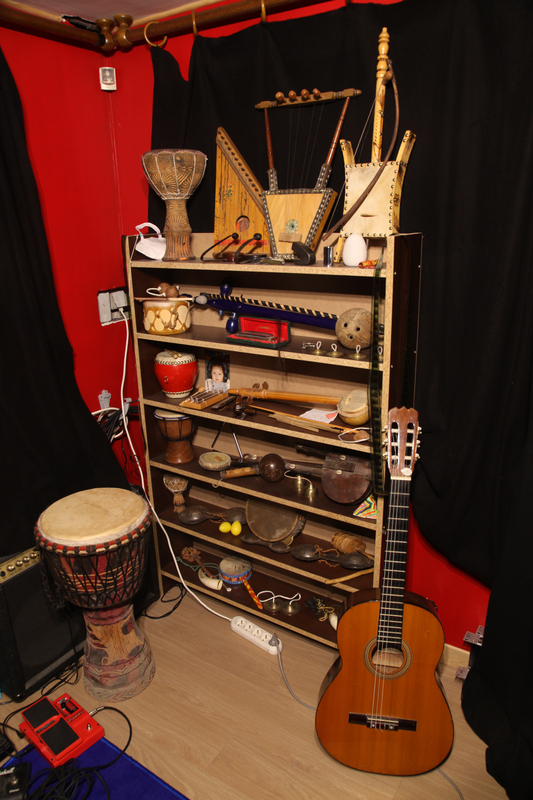 Most of these instruments were returned by foreign countries. Ornamental, but also useful. Was your minipops 7 dedicated in the Fnac store, de saint lazare en fevrier 2010??? J’ai l’impresion d’avoir être tout derrière toi dans la ligne d’attente. Belle machine… Je viens d’en acheter une. Oui!! En effet, c’était bien moi. C’était un drôle de moment. J’aurais aimé avoir la video qui a été tournée ce jour là. 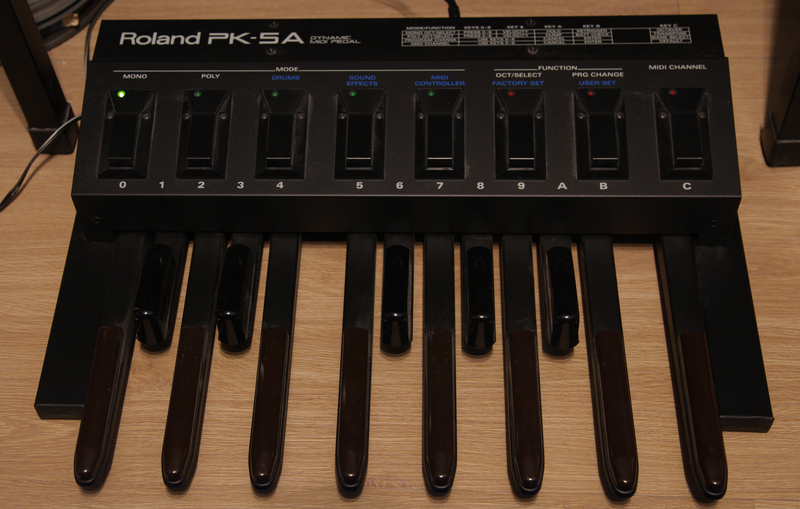 Avec ton Roland PK 5 A, je me demande si tu n’obtiendrais pas le même type de son de basse que l’on retrouve sur le morceau « I don’t care anymore » de Phil Collins ? En fait ce pédalier n’a pas de son propre puisqu’il ne délivre aucun son (contrairement à la pédale Taurus de Moog). Il se comporte comme un clavier maitre, à savoir qu’il envoie juste des messages MIDI. Donc n’importe quel son peut-être déclenché par le pédalier. Souvent j’utilise en l’occurence un son de basse de Juno 2 que j’affectionne. Ok ! J’ai confondu alors… Merci pour cet éclaircissement!